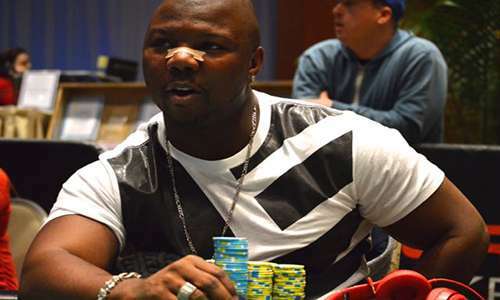 Semi-professional poker player Travell Thomas, best known in the poker world for winning two WSOP Circuit rings, has pled guilty to two felony charges in a major case involving fraudulent debt-collection practices. Thomas, of Orchard Park, New York, made his guilty please to separate counts of wire fraud and conspiracy to commit wire fraud. Thomas will face a sentencing hearing on February 10, 2017, before US Federal Judge Katherine Polk Failla. The two counts on which Thomas pled guilty each carry a maximum penalty of 20 years in prison, plus three years of supervised release. A press release issued by the Southern District of New York USAO office of Preet Bharara, which prosecuted the case, mentioned that the maximum sentence is proscribed by Congress, and mentioned four shorter sentences for other defendants in the case. Thomas and Maurice Sessum, a co-owner of the 4 Star Resolution LLC debt-collection firm at the heart of the case, personally took at least $1.5 in cash out of the business to pay for personal expenses. Travell Thomas is the eleventh defendant to plead guilty in the debt-collection case, which was filed in 2015, The case is described as “the largest debt-collection scheme” ever prosecuted, and continues a lengthy run of prosecutorial crackdowns against the often-lawless debt-collection business. That industry has created an informal hub in Buffalo, and has been the subject of several large prosecutions over the past decade. The latest case, involving Thomas, drew national headlines a few months ago, when Thomas and his attorneys accused prosecutors of being racially motivated, and even attempted to subpoena lead prosecutor Preet Bharara. The presiding judge in the case quickly quashed that motion, agreeing with Bharara’s assertion that the claims were unfounded. As part of the scheme, Thomas falsely inflated the balances of debts owed by consumers in the Company’s debt collection software so that Thomas’s debt collectors could collect more money from the victims than the victims actually owed, a practice known within the Company as “juicing” balances. Thomas also placed purported debts with more than one of his offices so that multiple collectors from within the Company could solicit and coerce a particular victim to repay a debt more than once. As owner and president of the Company, Thomas drafted, approved, and disseminated collection scripts that contained a variety of misrepresentations and instructed his collectors to make those misrepresentations to consumers over the telephone. At Thomas’s direction and under his supervision, the Company’s debt collectors, using a variety of aliases, attempted to trick and coerce thousands of victims throughout the United States into paying millions of dollars in consumer debts through a variety of false statements and false threats, including that: (1) the Company was affiliated with local government and law enforcement agencies, including the “county” and the district attorney’s office; (2) the consumers had committed criminal acts, such as “wire fraud” or “check fraud,” and if they did not pay the debt immediately, warrants or other process would be issued, at which point they would be arrested or hauled into court; (3) the victims would have their driver’s licenses suspended if they did not pay their debts immediately; (4) the Company was a law firm or mediation firm and that the Company’s employees were working with lawyers, a law firm, mediators, or arbitrators; and (5) a civil lawsuit would be filed, or was pending, against the victims for failing to pay their debts. Thomas’s Hendon Mob entry shows a total of more than $500,000 in tournament cashes, including the two wins in WSOPC prelim events. Most of those cashes came in East Coast tourneys, where Thomas was a regular participant.